When Dorothy Gale in The Wizard of Oz said “There’s no place like home,” she was, of course, referring to Kansas. From rolling wheat fields to a landmark-filled historic legacy, here are 25 ways the Midwestern state isn’t like anywhere else in the United States. 1. Kansas was once home to countless Native American tribes, who settled the area long before European explorer Francisco Vázquez de Coronado arrived in 1541. The state was named after the Kansas River, which derives its own name from the region's Kansa tribe. 2. The largest and most-well known city in Kansas is Wichita, but the state’s actual capital is Topeka. 3. Nicknames for Kansas include the Sunflower State, the Jayhawk State, the Midway State, and the Wheat State. 4. During the settlement of Kansas, the U.S. government allowed residents to vote whether Kansas would be a free state or a slave state. The political climate turned tumultuous, and a series of bloody clashes between pro and anti-slavery groups prompted New York Tribune editor Horace Greeley to invent the term “Bleeding Kansas.” The conflict presaged the Civil War, setting the stage for the violent years ahead. 5. Early Kansans were concerned with women’s equality, and granted them the right to vote in school district elections as early as 1861. By 1887, women were participating in municipal elections, and by 1912 Kansas had finally extended them equal voting rights—a full eight years before the 19th amendment was ratified. 6. Brown vs. Board of Education, the landmark Supreme Court case that ruled against segregation in public schools, started as a class-action lawsuit in Topeka after African-American children were denied admission to their local public schools. 7. In 1905, two chemistry professors at the University of Kansas discovered helium. 8. For years now, Cawker City, Kansas, and Darwin, Minnesota, have argued over which town is home to the world’s biggest ball of twine. In the mid-1950s, a Cawker City man named Frank Stoeber began fashioning an enormous twine ball. Several years later, he donated the final product—a sprawling 5000-pound sphere of string—to the town. After his death, residents added to it each year in an annual "Twine-a-thon,” as did visitors. Currently, the Cawker City ball holds the record for the World's Largest Ball of Twine—a fact that the people of Darwin resent. They believe that Cawker City is cheating, since a Darwin man named Francis A. Johnson rolled his own 17,400 pound ball over the course of 29 years. Darwin's residents console themselves by calling their novelty attraction the "World's Largest Twine Ball Rolled By One Man." 9. Other quirky roadside attractions in Kansas include Subterra Castle, an underground missile launch complex that was transformed into a livable home; the World’s Largest Easel, an 8-foot stand that displays a 32-by-24 foot replica of one of Van Gogh’s “Sunflower” paintings; and a bizarre grassroots sculpture garden called the Garden of Eden, which showcases political and religious-themed works. 10. In the 1870s, Kansas resident Dr. Brewster M. Higley wrote a poem called “My Western Home.” Its words were set to music, and eventually became the basis for the iconic Western ballad Home on the Range. 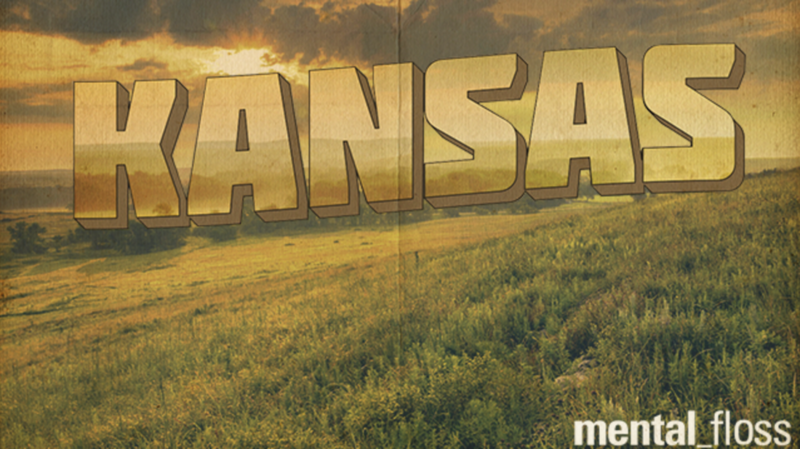 In 1947, Kansas designated "Home on the Range" as its official state song. 12. Apart from Dorothy Gale, real-life famous individuals from Kansas include everyone from actress Kirstie Alley and singer Melissa Etheridge to pioneering female aviator Amelia Earhart and the poet Langston Hughes. 13. Laura Ingalls Wilder’s nostalgic childhood novel Little House on the Prairie and Truman Capote’s true crime tale In Cold Blood are two classic works of literature set in Kansas. 14. This may not surprise anyone, but the American rock band Kansas did, in fact, form in Kansas—more specifically, in Topeka. 15. The world’s very first Pizza Hut was opened in Wichita, Kansas, in 1958 by two brothers named Dan and Frank Carney. They were still in school at Wichita State University, so they paid for their business endeavor by borrowing $600 from their mother. 16. Dwight D. Eisenhower, the 34th President of the United States, spent much of his early life in Abilene, Kansas, and considered it his hometown. 17. It's home to the contiguous 48 states' geographic center, located about two miles outside of Lebanon, Kansas. 18. Kansas produces more wheat than any other state in the country. Nearly one-fifth of all wheat grown in the United States is grown in Kansas, and it’s said that enough is cultivated to bake 36 billion loaves of bread, or feed everyone in the world for about two weeks. 19. Speaking of wheat, the graham cracker gets its name from the Reverend Sylvester Graham (1794-1851), a Presbyterian minister and nutrition advocate from Kansas. He’s credited with inventing the bland snack food because he believed that it would help curb sexual urges. 20. Kansas is so dry and dusty that it might surprise you to know that millions of years ago, a succession of ancient seas once covered its plains. Today, geologists can find fossils of corals, shelled sea creatures, and larger aquatic animals like fish, sharks, and reptiles. 21. Ever heard the expression “Kansas is flatter than a pancake?” In 2003, geographers decided to test the colloquialism by making a topographic profile of an IHOP pancake using a laser microscope. They compared it with a digital model of the state’s elevation date, and found that Kansas was, indeed, flatter than a pancake. Subsequent research, however, shows that six states—including Florida, Illinois, and North Dakota—are actually flatter than the Sunflower State. 22. Dodge City, Kansas—not Chicago—is, according to NOAA data, the windiest city in America. 23. Former Republican presidential candidate Bob Dole launched his political career as a Kansas senator. 24. Kansas' first airplane factory was built in Wichita in 1919. The city would later go on to become one of the nation's leading plane manufacturers. 25. It's not a stereotype: Kansas does have a lot of tornados. From 1950 to 2012, the state experienced an average 61 twisters a year. However, if you look at the data from 2003 to 2012, that figure jumps to 112 per year.